George Curry, aka: Flat Nose, Big Nose (1864-1900) – Born on Prince Edward Island, Canada about 1864, Curry moved to Nebraska with his family when he was still a child. At the age of 15 he drifted west and soon became involved in cattle rustling. Some where along the line, a horse kicked him in the nose, earning him not only a disfigurement, but also the nicknames. He soon joined the Wild Bunch with whom he participated in several holdups. While working with Cassidy’s gang, Harvey Logan adopted his surname and became known as Kid Curry. In June, 1897, George Curry, along with Harvey Logan and Tom O’Day held up the Butte County Bank at Belle Fourche, South Dakota. O’Day was arrested immediately as his horse had run away, but the other two escaped. However, while Curry and Logan were holed up in Fergus County, Montana, a posse caught up with them and hauled them back to South Dakota where they were placed in the Deadwood jail. The outlaws, however, had other ideas and in November they overpowered the jailer and escaped. 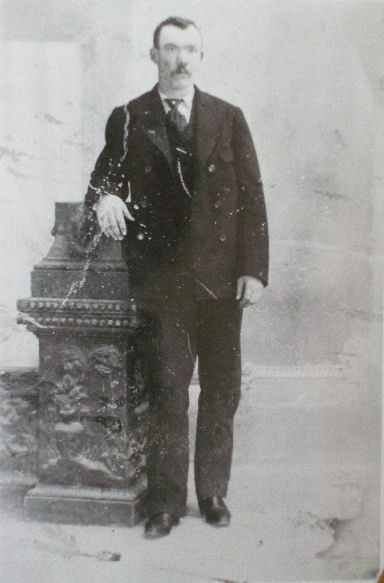 After participating in more robberies of post offices and trains, Curry was rustling cattle in Moab County, Utah when lawmen Jessie M. Tyler and Thomas Preece finally caught up with him on April 17, 1900 and Curry was shot and killed. His friend, Harvey Logan, was so enraged that he soon traveled to Utah where he killed both Tyler and his Deputy, Sam Jenkins, in a gunfight. Curry is buried in Chadron, Nebraska.